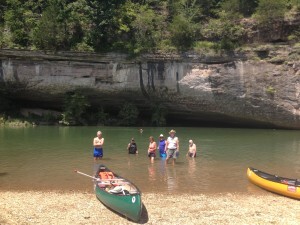 This past Wednesday a dozen of us had an OUTSTANDING canoe float from the US-65 bridge to Gilbert . The water level was high enough we did not have to paddle much and we got to traverse about a dozen rapids . It only took us 2 hours (instead of the normal summer 3 hours). So at the end we body floated for an hour in the current . Best yet it was sunny and in the 80’s with low humidity . So some want to do another canoe float soon . We were joined by a new Fairfield Bay resident Tom Iverson who just moved into the house at the intersection of Snead and Woodlawn. Tom has canoed the entire Buffalo river and highly recommends Buffalo Point to Rush which is a historic GHOST town . Near Rush is a 1 mile flat hiking trail with historic markers discussing the local history . The bad news is that this could be a 4- 5 hour canoe trip this time of year but closer to 4 hours if northern AR gets any rain this weekend as forecasted . Tom Iverson is willing to lead a group of explorers on this canoe trip to check it out for a larger group float next spring .